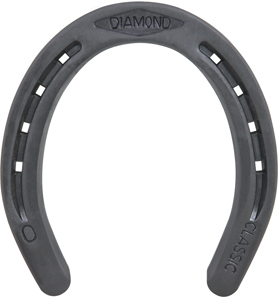 The Diamond Classic Plain is a basic flat, 1/4" thick, creased horseshoe in a one shape pattern (no front or hind) designed for versatile use. This is an excellent shoe for general riding; outstanding quality at a competitive price. Shoes are symmetrical. Punched for City or Slim blade nails.